I am super happy with the new chits in the game. Everything is higher-rez, and the click trackers are actually double sided! This seems to be surprising people! I need to get pictures up. I'm looking for "achievements" to unlock bonus points in an upcoming Netrunner league, to help encourage playing in different styles. Does anyone have a good list, or can think of fun ways to mix up things? I'm thinking the league will be Cache Refresh to help out newer players. maybe something about using a resource to prevent an agenda from being scored? something about traps? accessing an agenda with 6+ counters on it? Beginning your corporation turn with a card with 6+ advancement counters on it and no other cards in or protecting that server? -Score a agenda worth six or more points. Also, BurgerTokens seems to have a Netrunner set out now. This is the form we used for our league nights. Games past the second against a single person weren't counted until you'd played everyone in the league at least twice. You also got bonus points for playing games with unique IDs, so people would often show up to game night with 4 different decks. At the end of 6 weeks, we had a double-elimination tournament, with seeding determined by league points. Separate prizes (usually from a GNK kit) were also given out to those who had the 1st - 3rd most achievement points, as well as those who had the most competitive points. Thanks everyone so much for the help and advice! Edit: The burger tokens website isn't very clear. Am I reading that right, where basically they are stickers/adhesive that go on pennies? Yeah, the idea is that the penny is the burger, and the caps are the buns. You supply your own pennies, since it'd cost more to ship them than the pennies are worth. That seems pretty cool! Are the stickers domed in some way? They mentioned stackable, so my first thought was that they were, like, convex on one side, concave on the other, so they formed "dishes." Pack four of Kitara just got announced. The Devil and the Dragon. Oh hey new Crim ID. Oh my god WHAT? Oduduwa is... wow. THOSE CRAZY BASTARDS! They finally did a Weyland Public ID! Also I kinda like that we're actually getting multiple Apex cards this cycle. The bug really needs it. Unconvinced by those Crim cards. The counter-drip of 419 isn't bad, but isn't exactly really hurting the corps (aside from making them play a hedge fund first before ice). They'll control what they want you to see anyway, and if they're installing multiple cards it only triggers the one time. Like, there's a reason Reina doesn't see much play and their abilities are very similar. Falsified Credentials is a Sure Gamble that can be played from 1 credit, which isn't bad, though of course if your opponent makes no remotes it's useless. Slightly better than Queen's Gambit, I think. Like the new Weyland public ID and agenda, though it doesn't protect itself well in R&D or HQ. Still, like the idea of it in a Punitive deck. I agree, but if there is more stuff that triggers off expose (like aumakua) you can fork the Corp pretty hard. Does the ID get prevented by corp playing Hedge? It isn't installed so them installing ice would trigger it. I think in a world of asset spam and combo decks it seems bad, but likely good against more fair netrunner decks... who plays those now? The point is more, if they don't want to reveal their ice to you they have to play the hedge fund first, else they don't have the 5 credits needed. I was being tongue-in-cheek here cause there's literally no reason to not play the money first. Mine arrived today, so I can answer that. 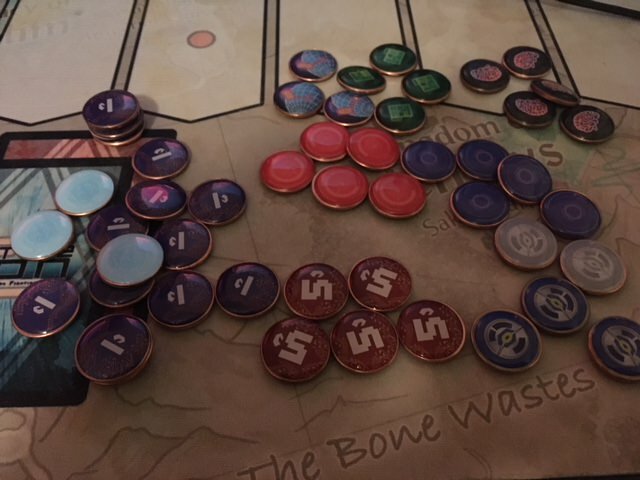 Apparently the epoxy they used on the stickers is very slightly... well, sticky, so the tokens can stick to each other. Not sticky enough that it would actually stick to anything else but themselves, though. They're smooth to the touch. You're not going to want to pick a stack of them up by one and wave 'em around, but they won't fall over if you pick them up or move them around. I tried to get this in but missed out on all stock of it. So I am awaiting my ability to get into this game patiently lol. Happy New Cards Day, everyone! Sovereign Sight drops today. Spoilers came out while we were in the Upside Down, and most of them seem to be on NRDB. There's a HB ID in that set as well, as well as the new Apex card which doesn't seem to be on there for some reason. I know I'm super stoked for Wake Up Call. And there's the article for Sovereign Sight being out. Asa Group seems... pretty good? Could be crazy with Calibration Testing. UFAQ for Sovereign Sight is up. By Any Means is now an insanely good card. I honestly didn't think of the Cyber-Cipher and Assimilator thing, where if you flip it up via Assimilator, it doesn't trigger the "when installed" thing and you can actually use it on any server. Also, oh right, I guess you can Dedication Ceremony a Reconstruction Contract to FA things now. Neat. Its fecking hard though. Weyland problem of the runner winning whilst you do fiddly things. Pack 5: Whispers in Nalubaale. "Anarchs excel in proliferating the spread of virus counters, as well as trashing cards from the Runner’s grip." Contaminate on a Hivemind after a purge seems pretty gross, though I'm out of the loop so maybe there are better ways to do that by now. eta: oh wait, I guess Medium and Parasite don't exist anymore, is Hivemind just total garbage now? Mwanza City Grid seems pretty amazing if you have the cajones to turn it on. Put it on HQ, and assuming you actually have cards there for the runner to access, you got +10 credits for one click. Not as cute as a teacup giraffe, though. I mean, yeah? Anarchs are pretty good at hurting themselves. I mean, it helps on Aumakua, and Chakana is still in the cycle! Put it in Haarpsichord, it's only 1 inf. So word is that stores were being sent info directly about ordering the new Game Night Kits from their distributor reps. Heads-up in case they havn't, since the ordering window for the next two ones (the March and June releases) are open for the next two weeks. I hope you slotted employee strike! Pulled out our store championship kit to verify the contents and put up our poster. Part of me wants to take the organizer event swag because I won't be playing. Part of me thinks it would be a nice, unannounced "Scorched Earth" prize. Man, I wish our “local” stores were that on top of stuff. Still waiting for them to announce a DATE for the SC’s. Down the White Nile has a US release date of 2/1. The rest of White Nile. Hi yes please Forced Connection. Also looks like Adam just freed up all the influence he had to burn on Special Orders. Speaking of "neat stuff", another pack got spoiled. ...the FINAL pack of the cycle, Kampala Ascendant. You can imagine my reaction to Black Hat right now. WELCOME HOME SCORCHED EARTH! LET'S BBQ SOME MOTHERFUCKERS!